Irish Portrait Artist. Biography, Paintings. The academic style portrait artist and oil painter Gerald Kelly enjoyed a long association with the Royal Hibernian Academy (RHA) being elected a full member and exhibiting for over sixty years (1905-1969). He was born in London, educated at Cambridge University and studied drawing and painting in Paris, in the academic style of art. The painter Whistler was an early influence. Kelly himself was an avid traveller, visiting America, South Africa, Spain, and Burma, where he executed some of his most characteristic figure drawings. 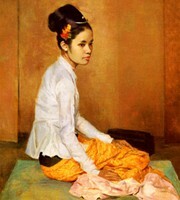 Kelly gained a reputation as a technically accomplished exponent of academic portrait art, specializing in children and women. Among his many portrait subjects were Somerset Maugham, whose portrait he painted several times. In addition, Kelly completed numerous formal state portraits. In 1930, he was elected a member of the Royal Academy (RA). He also became a member of the Fine Arts Commission (1938-43), being knighted in 1945. 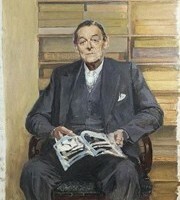 During the period 1909-1970 Gerald Kelly exhibited over 300 works at the Royal Academy, becoming President from 1949 to 1954. The painter John Napper worked as his assistant. Kelly's art reached a wide audience during his lifetime through a series of prints of his paintings. Since his death however his reputation has stalled. His pictures and portraits are represented in many public collections, including the Tate Gallery in London. He had retrospective exhibitions at the Leicester Galleries in 1950 and in 1957 at the Royal Academy.  For more about portraitists like Gerald Festus Kelly, see: Irish Art Guide.  For more about academic portraiture, see: Homepage.